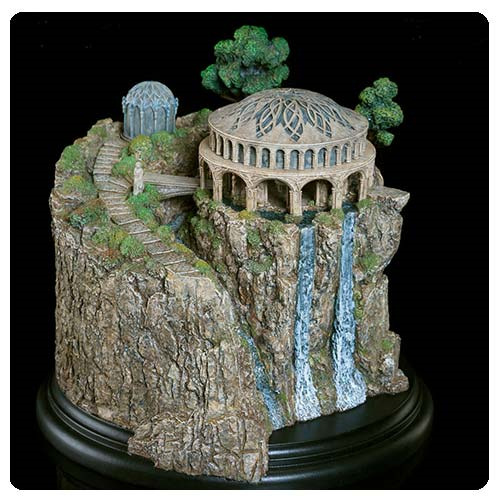 Features a removable domed roof that lets you peek into Elrond's chamber! Polystone mini-statue measures 5 1/10-inches wide x 5 1/10-inches long x 4 9/10-inches tall. Amazing detail in the 24 pillars of the chamber! With a removable domed roof that allows a peek into Elrond's chamber, The Hobbit An Unexpected Journey White Council Chamber Mini-Statue is an iconic piece from the first film in The Hobbit movie trilogy. The polystone miniature statue measures 5 1/10-inches wide x 5 1/10-inches long x 4 9/10-inches tall, and it's based on the Rivendell set featured in The Hobbit: An Unexpected Juorney. Not only does it feature the White Council Chamber but the statue includes cool details like the waterfall and surrounding shrubbery. The Hobbit An Unexpected Journey White Council Chamber Mini-Statue is the first in a line of collectible environments from Weta. Open edition.